Intuit is journeying to Paris, May 27-June 1, to visit our acclaimed exhibition, Chicago Calling: Art Against the Flow (Chicago: foyer d’Art brut) during its time at La Halle Saint Pierre. You are invited to come along for the ride! We will find l’art brut both in and around the city. Together we will explore museums, art studios and more off-the-beaten-path attractions. You must be an Intuit Member to attend. Intuit memberships start at $40. The trip will have an optional extension to Vienna, Austria, June 1-4. We will be visiting the Flying High: Women Artists of Art Brut exhibition at the Bank Austria Kunstforum Wien and other mainstream exhibitions at the Albertina Museum and Museum Gugging. If you are interested in joining this leg of the trip or if you have any questions, please email teddy@art.org. Set on a quiet road in the heart of Paris, Hotel Adèle & Jules is a boutique hotel steps from the Grands Boulevards. The Hotel offers a trendy take on a classic Parisian style, as well as complimentary tea time and an included breakfast bar. 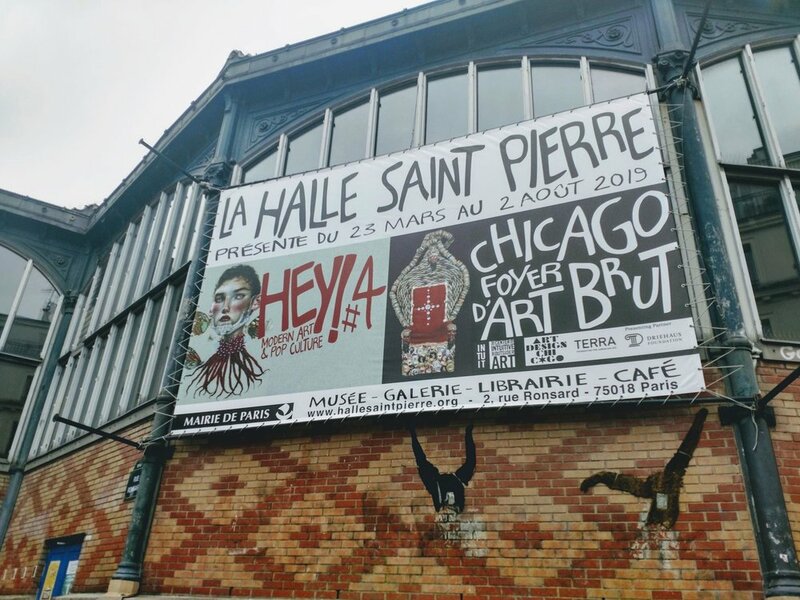 Halle Saint-Pierre is the only museum in Paris dedicated to outsider art and will be exhibiting our very own Chicago Calling: Art Against the Flow. The museum is in the renowned artistic quarter of Montmartre and sits below Sacre Coeur cathedral. Centre Pompidou, Paris’s National Museum of Modern Art, will be hosting an exhibition on Victor Vasarely, the father of optic art, during our visit, in addition to the museum’s prestigious permanent collection. 59 Rivoli Studios is a formerly abandoned apartment building transformed into a space for artist studios and exhibitions as a place for collaboration, creation and inspiration. It now houses 30 artist studios that open to the public every afternoon and offers frequent events and an iconic façade. Jean Dubuffet’s La Closerie Falbala invites the visitor to an alien landscape of 6,000 feet of white and black paint leading up to his Villa Falbala, a cavern-like structure housing his expansive work. Dubuffet coined the term Art Brut and constantly sought out new forms of art, and his extraordinary innovation is evident in this imaginative terrain. La Fabuloserie is a labyrinthine “museum-house” and a whimsical sculpture garden featuring more than a thousand works of “hors-les-normes” art collected by founder and architect Alain Bourbonnais. The museum’s Inhabited Garden is full of strange and spell-binding works circling an ornamental lake, all from the private collection of Bourbonnais. Over three decades, Raymonde Isidore, creator of La Maison Picassiette, turned his ordinary family home into an extraordinary, complex and enchanting work of art by covering his house and garden entirely with intricate mosaics of broken crockery, paintings, and sculpture. The result is both playful and inspiring. With more than 4,000 feet of murals, Bel Air Frescoes is an impressive reimagining of four formerly drab, grey apartment buildings in the city of Chartres. Each building has a different theme that reflects the identity of the region, with walls inspired by everything from stained glass to the Eure River and French cottages of old. Chartres Cathedral is a UNESCO world heritage site, widely considered one of the great cathedrals of the world. Lille Metropole Museum of Modern Art in the city of Lille has a collection of modern, contemporary and outsider art, including works by Aloïse Corbaz, Fleury Joseph Crépin, Henry Darger, Auguste Forestier, l’Abbé Fouré, Madge Gill, Jules Leclercq, Augustin Lesage, Michel Nedjar, André Robillard, Willem Van Genk, Josué Virgili, Adolf Wölfli and Carlo Zinelli.